This effect has what is probably the strangest theme of the book, but this routine might well be applied to almost any type of related plot. Its occult nature should intrigue those watching. Effect: The performer explains that not only do people, and other living things, create "vibrations" which may be detected, but also that the ancient magical technique of casting a Panticle is capable of creating powerful vibrations which often can affect, and perhaps, on occasion even control people's thoughts and actions. To demonstrate his point, the performer brings out five sealed envelopes, all identical in appearance. These are mixed and then laid out in a line in front of a spectator, who is asked to pass his hand over the top of the envelopes until liis hand seems to be somehow drawn to one of the five. The performer explains that a small feeling of tingling, or heat might well be felt when the spectator's hand is over the proper envelope. After the spectator has decided on one of the envelopes, the performer, who can be seen to be empty handed, asks to be handed it, after which he asks the spectator to open up the remaining four envelopes and show everyone what they contain. Each of the four envelopes are found to contain a small folded blank piece of paper, absolutely nothing eke. With empty hands, the performer then openly rips off the top of the chosen envelope, reaches in with his first finger and pulls out a folded piece of paper, which he hands to the spectator to open. Asked to show and describe what is on the paper, the spectator shows a strange drawing, somewhat occult and mysterious looking, as the performer explains that it is a copy of the "Panticle of Love" developed in the middle ages and kept alive by the "hidden brotherhood." The performer also explains that the vibrations it creates are so powerful they can attract almost anyone who comes near it, and that is how the spectator was able to choose the envelope that contained the "Panticle." This is just one of the many possible designs. This size slip if folded once in each direction and then wrapped around i■our first finger, will just fit under a Vernet finger tip. onicone thai they love, or would like to have love them, in a blank •I'.i"- In the center of the Paiiticie. The performer then asks that the "r«n(ule"be refolded, and then he tears the "Panticle" to shreds, • • H lining that the tearing has released the "Panticle's" power. AO 11 iv. the spectators if they felt a surge of energy as the Panticle was ¿•Hii'vrd, the perfomer explains that he had a flash of a person who he niies briefly, and even states a name he feels might be connected »1 tins person. It is the very same name and person that the spectator Mr<> I on the "Panticle of Love." Method: The techniques involved in this effect are threefold. First of all, each of the five envelopes at the start, in reality, contain only blank pieces of paper. 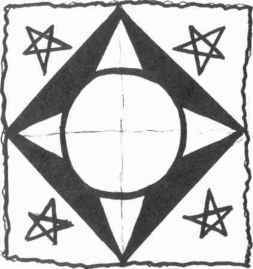 The "Panticle" itself, is any occult type drawing, with a blank space in the center of it. The "Panticle" is then folded once in each direction and then is curled around the tip of your first finger, after which a finger-tip is slipped on to your finger, covering up the "Panticle" from view. A little experimentation with different sized "Panticles" will prove to you that quite a fair sized slip of paper may be concealed on your finger in this manner. When the spectator does settle on a choice of envelopes, have the chosen one handed to you while you request that he open the remaining envelopes and show their contents. Of course, each envelope he opens will contain only a blank paper. After he has opened the last envelope, you allow your hand to be seen empty, rip off the top of the chosen envelope, and stick the finger with the loaded tip 011 it into it as if to pull out its contents. In reality, your other hand squeezes the envelope, retaining the finger-tip inside of it as your finger pulls out the loaded "Panticle." 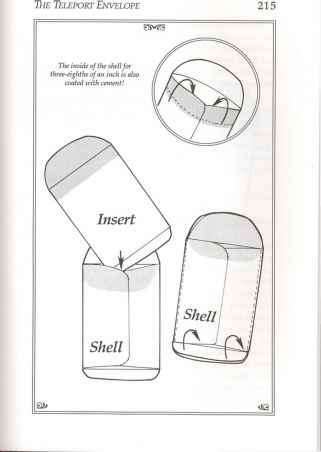 Then crumble up the envelope, as your fingers spread the "Panticle" with your other hand. The second phase has the spectator printing the name in the center of the "Pantide . "which you then "destroy to release its power." As you've probably surmised, it's our old friend the Center-Tear at work again, which is, of course, how you are able to discern the person's name. The third phase is a bit of psychological reading. You will know if the person is male or female via the Center-Tear, so you build a word picture of what this person might be like. A lot of flattery, (for who loves a loser,) the briefest and vaguest physical description, finished off by stating the proper name will give those watching the impression that you have "felt the Panticle's power." Of course you don't have to use the "Panticle of Love" theme. Depending upon the type of audience and type of work you do, the "Panticles" of "Evil," "Power," "Travel," "Health," or whatever else you wish may be done using this method of presentation. Just make sure that the information to be gotten via the Center-Tear is consistent with the concept of a "Panticle" and the type of "energies" you wish to invoke.